Bangkok – Bangkok, Phuket, and Samui were the most popular Thai destinations for international travelers in 2012, according to Hotels.com’s Hotel Price Index (HPI). The hotel booking website also says that with 21 million foreign visitors last year, Thailand is one of the fastest growing countries for the travel and hospitality industry. Bangkok was most appreciated for its vibrant nightlife, shopping attractions, and cultural sights, as well as great value at hotels in all star-categories. Phuket ranked second especially by Chinese, Hong Kong, Australian, and Kiwi visitors. Koh Samui as third-most popular, and then Pattaya, Krabi, Chiang Mai, Hua Hin, Koh Phangan, Koh Phi Phi, and Koh Tao – in that order. In general, Thailand is favored for its pleasant weather, cultural attractions, and variety of travel destinations. However, two additional reasons, and “mega trends” for year 2013 were stated: “The continued rise of Chinese outbound travelers and the increase in low cost carriers across Asia.” So far China is the top source country for travelers to Thailand. Following countries were Malaysia, Japan, Russia, and South Korea. Bangkok – Sixteen properties under the Onyx Hospitality Group, a Thailand-based hospitality company, recently received the TripAdvisor® Certificate of Excellence Award for 2013. The group’s flagship Amari properties – including Amari Atrium Bangkok, Amari Watergate Bangkok, Amari Residences Bangkok, Amari Coral Beach Phuket, and Amari Orchid Pattaya – were honored with 10 Excellence awards. Some Onyx properties were victorious in other categories, too. Out of more than 700 rivals, Oriental Residence Bangkok came out as the overall winner in the category of luxury hotels and top hotels in Bangkok in TripAdvisor´s 2013 Travellers’ Choice® awards. The accolade is given to hotels that consistently achieve excellent traveler reviews on Tripadvisor, the leading international travel. Onyx is one of the Asia-Pacific’s leading hospitality management companies, with over 45 years of industry presence. The group has currently operates 34 properties across Asia, and more are on their way in the next few years. 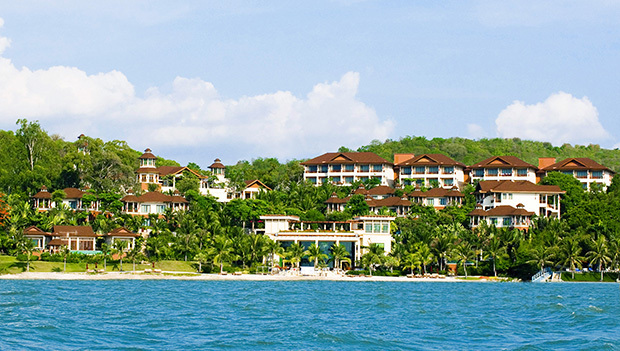 Phuket – Pullman Phuket Arcadia, the first Pullman resort on the island, opened recently. 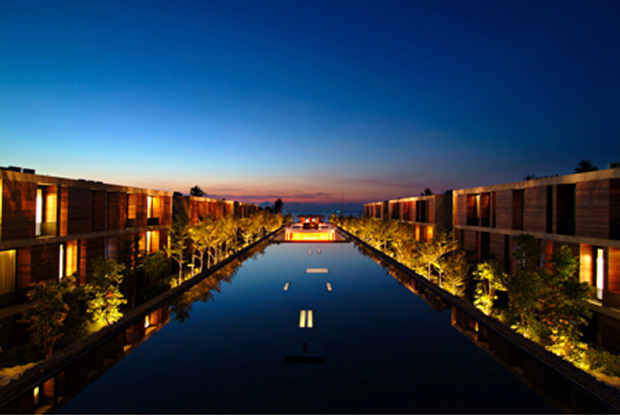 The upscale lifestyle resort is located on Naithon Beach, overlooking the Andaman Sea and less than 15 minutes from the Phuket International Airport. “Pullman has been very successful in Asia, especially in Thailand where this resort will be the fifth Pullman property in the country. I strongly believe that Pullman Phuket Arcadia will become a major player in Phuket’s upscale market,” says Patrick Basset, the senior vice president of Accor Thailand, Vietnam, Cambodia, Laos, and the Philippines. The resort has 277 guest rooms and a 389 square meter ballroom for meetings and events. Guests may choose from many dining facilities, such as Elements, serving Thai and Western classics, or Vero, concentrating on Italian cuisine. For the evening, Vinoteca, a wine library guarantees quality wines sold by the glass or bottle. Cha-Am – As a sign of gratitude for the continuous support of Thailand´s travel industry, Hotel de la Paix Cha Am offers a promotion package for guests working in travel sector. Qualified guests will be given a special rate on room bookings, Bt3,000, with buffet breakfast for two until the end of August. “Thailand’s travel industry is a great institution to be a part of, with companies constantly pitching in to work collaboratively. This is just our way of saying ‘thanks’ for generating such a positive working platform,” said Nigel Tovey, GM of Hotel de la Paix Cha Am. Hua Hin – InterContinental Hua Hin Resort has earned the “Hotel Best Thailand” honors at the Asia-Pacific Hotel Awards, held in Malaysia recently. The award is the latest in the string of awards that the hotel has been garnering since it opened in 2009. Apart from this recent award, the resort has also been voted “Winner of Excellence” 2013 by TripAdvisor. Phuket – Aleenta Phuket-Phang Nga Resort and Spa offers ‘Great Mates Escape’ — an exclusive package for friends and groups of four to eight people, for only a fraction of the cost of a private holiday. 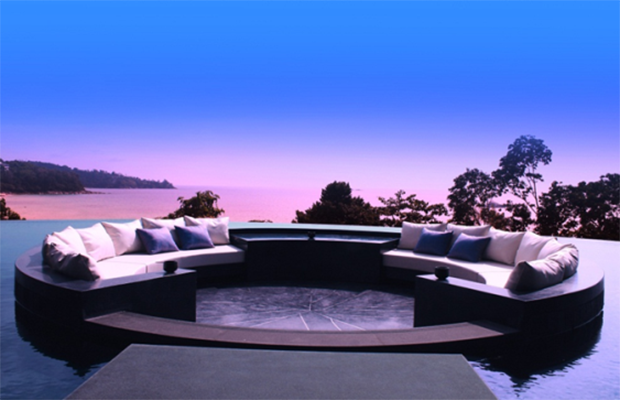 “’Great Mates Escape’ was an innovative idea based on the simple concept of sharing,” says Anchalika Kijkanakorn, the founder of the management company AHMS Collection behind Aleenta Phuket-Phang Nga. “A fantasy escape is suddenly much more attainable when the cost of the villa is shared between a group of friends or several couples,” she says. Bangkok – Jonathan Wigley, CEO of Absolute Hotel Services (AHS) Group, has announced another Eastin Easy property in Thailand. 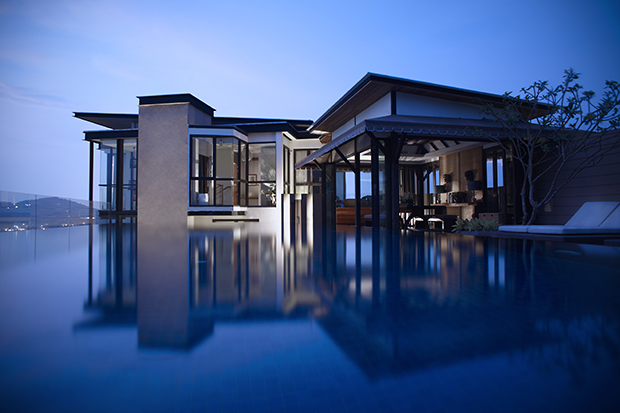 AHS’ portfolio in Thailand continues to expand quickly with Eastin Easy Patong Phuket, which will be ready to open by within the 4th quarter of 2013. Eastin Easy Patong Phuket is located on Ratcha Uthit, Patong Kathu and will feature 55 superior rooms, designed in a modern contemporary style with comfortable facilities and functional space. Other facilities include outdoor swimming pool on the ground floor adjacent to the fully equipped gym. A restaurant with an incorporated retail element will be on the second floor, serving breakfast, lunch and dinner. AHS properties that just opened in the second quarter of this year are: U Sunsuri Phuket and Eastin Hotel Pattaya in Thailand, U Paasha Seminyak Bali in Indonesia, U Tropicana Alibaug, Eastin Easy Citizen Ahmedabad, and Deltin Suites Goa in India. Pattaya – From now to August 31, guests of Sheraton Grande Sukhumvit, A Luxury Collection Hotel, Bangkok, can travel in style with a shuttle service to the hotel’s sister property Sheraton Pattaya Resort. Simply make a reservation for both hotels and enjoy a complimentary one-time round trip transfer. Sheraton Grande Sukhumvit is renowned as one of the finest hotels in Asia. Located in the heart of Bangkok’s business and entertainment district with a pedestrian sky bridge link from the hotel entrance to the BTS Asok SkyTrain station and Terminal 21 Shopping Mall, and a few steps from the MRT Sukhumvit subway station, the luxurious hotel provides convenient access to the city’s many fascinating attractions. Rates for a luxurious Deluxe room at Sheraton Grande Sukhumvit start from just Bt6,500++ per room per night. Less than two hours’ drive from Bangkok, Sheraton Pattaya Resort is located on a cliff headland, overlooking the Gulf of Siam. 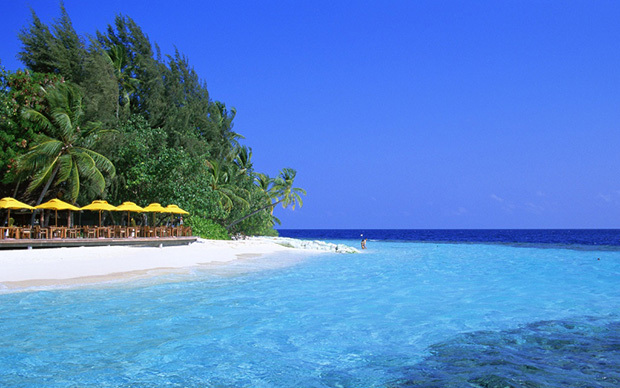 The resort enjoys a fabulous beachfront location with unsurpassed views to Coral Island and beyond. The resort features 156 spacious rooms, including 40 pavilions and two villas, each decorated with a tasteful mix of traditional and contemporary Thai design elements. 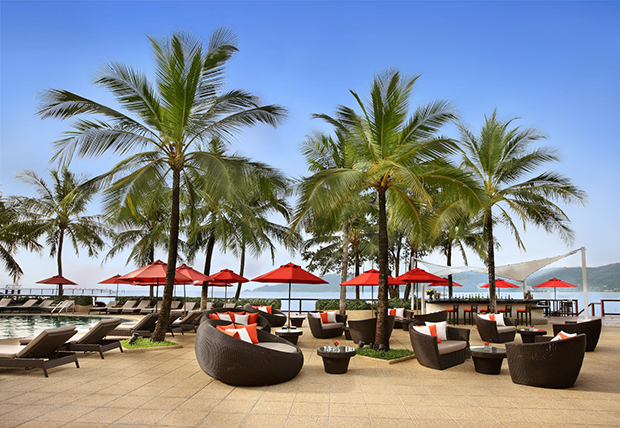 Rates for a Garden View room at Sheraton Pattaya Resort start from just Bt5,500++ per room per night. For reservations, contact 02-649-8666 or e-mail reservations.sgs@luxurycollection.com and 038-259-888 or e-mail reservations.pattaya@starwoodhotels.com. Pattaya — Tulip Group has entered into a Memorandum of Understanding (MOU) with Golden Tulip Hotels and Resorts for a new luxury 5-star hotel on Soi 5 Phratamnak Hill. 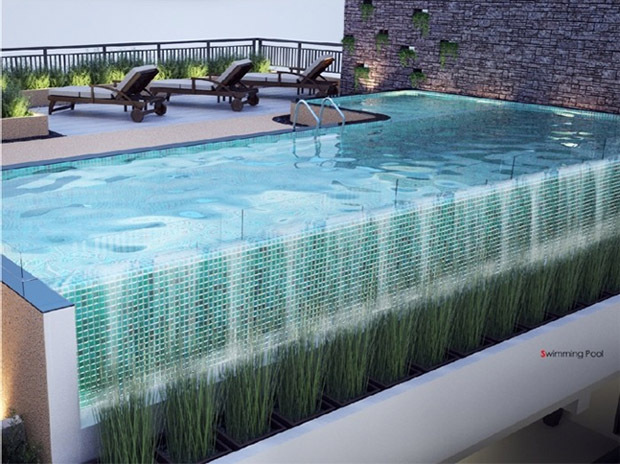 The luxury 25-storey high-rise building of Royal Tulip Suites Pattaya is set to be one of the most beautiful properties in the area. It is just steps from the stunning Cosy Beach, EIA and building permit are already in place, and Tulip Group will start construction on the project as soon as agreements are in place with Golden Tulip Hotels. Tulip Group is planning to offer a limited number of rooms of the hotel-only property to investors. Full details have not been disclosed but it is expected that investors buying into the project will be offered a leaseback program, with guaranteed returns, no ongoing management or sinking fund costs, as well as some additional investment benefits. This property will be Tulip Groups second property with the operator. Last year they signed agreement for a Golden Tulip Hotel and Residence in Central Pattaya. Lubosh Barta, GM of Four Seasons Resort Koh Samui, and Ms. Titiya Chooto, GM Four Seasons Resort Chiang Mai, together with M.R. Priyangsri Watanakun, Director of the Thai Red Cross Society’s Fund Raising Bureau and the sponsors recently presented a check of Bt3,449,312 to Her Royal Highness Princess Maha Chakri Sirindhorn, executive vice-president of the Thai Red Cross Society, on behalf of the ‘Hematological Cancer Research Center’ at Chulalongkorn Hospital. The monies represent the proceeds from various activities organized including the “16th Cancer Care Run” in Bangkok, Chiang Mai and Koh Samui; “7th Clutter Sale” organized by the NewsMakers; and the “6th Christmas Tree Charity Project” organized by the hotel with Livinget. and Wallpaper Magazines, which will all be used for cancer research to be conducted by the center. 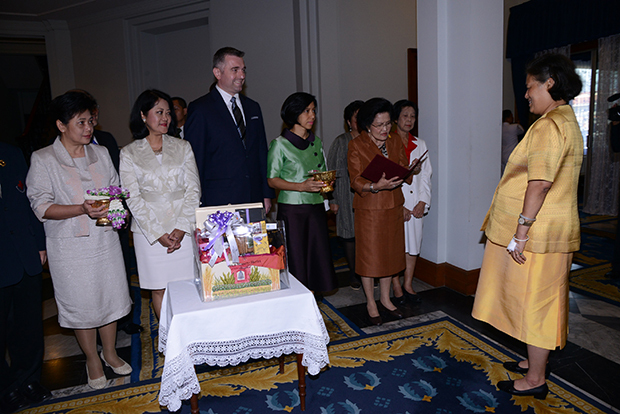 In photo (right to left): Her Royal Highness Princess Maha Chakri Sirindhorn, M.R. Priyangsri Watanakun, Titiya Chooto, Lubosh Barta, Annabelle Daokaew, PR Manager of Four Seasons Hotel Bangkok; and Duangrat Watanapongchat, chief of Portfolio Management & Trading of KT-ZMICO, one of the sponsors. 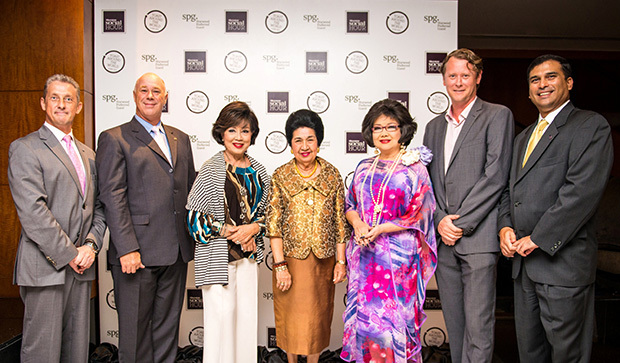 Royal Orchid Sheraton Hotel & Towers in Bangkok celebrated the first anniversary of Sheraton Social Hour with wine tasting and the rollout of a new global signature wine program. They also took part in a 24-hour ‘Toast Around The World’ event, which passed from Sheraton Hong Kong to Sheraton Waikiki. Over 100 in-house guests, local residents of the city and the management attended the anniversary, which showcased Treasury Wine Estate and Ste. Michelle wines, complemented by world-renown cheeses. The “Social Hour” offers guests’ premium wines and weekly tasting. Phuket – The 2013 Cape Panwa Hotel Phuket Raceweek presented by Mount Gay Rum, celebrates its 10th Anniversary with a strong fleet of boats and international crews taking part 17-21 July at the five-star Cape Panwa Hotel. An exciting race programme on-the-water, combined with a popular onshore social scene kicks off with a Barbadian-themed opening party and concludes with a lavish ticket-only Gala Dinner hosted by Cape Panwa Hotel. “2013 is a milestone year for the event. We look back at the last nine years in which Raceweek has built a reputation for delivering one of the best regatta experiences in Asia, and we celebrate this the 10th Anniversary year while looking forward to the next decade and develop on the success of this award-winning regatta,” said Mr. Byron Jones, Managing Director of co-organiser Media Business Services (MBS). The luxurious Cape Panwa Hotel is an ideal regatta venue with its established international reputation, private beach and pier, and spectacular sailing grounds right on the hotel’s doorstep. 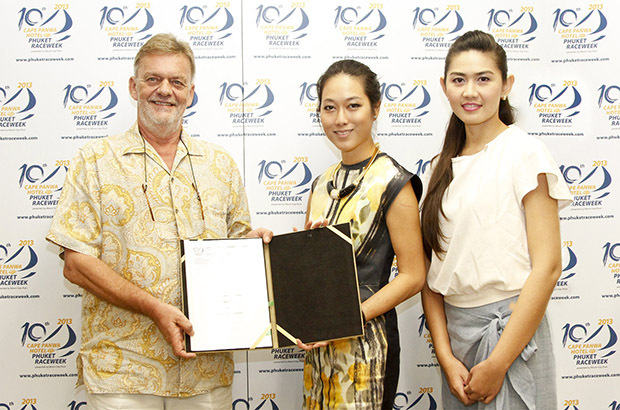 Following their successful first hosting of the event last year, Cape Panwa Hotel recently extended their title sponsorship and committed to be the home of Phuket Raceweek through 2015. Four days of world-class yachting racing in Phuket, combined with four nights of magical, beachside parties has proven to be an award-winning formula for Phuket Raceweek having been voted ‘Best Asian Regatta of the Year’ at the 2011 Asia Boating Awards. Such accolades have helped to firmly establish the regatta on the Asian yachting circuit and the event’s worldwide recognition is evidenced by an increasing number of charter boats taking part this year, underscoring Phuket’s position as a leading sailing and marine tourism destination. Bangkok — Sansiri PLC, one of the largest real estate developers in Thailand, supports Patinyakorn Buranrom, a 29-year old sailor from Phuket to become the first Thai skipper to compete in the Transpacific Yacht Race (TRANSPAC) 2013, starting on July 8. “I have worked very hard getting to the stage where I was competitive and with Sansiri´s support I have now enjoyed success at a local level. To skipper a yacht in the TRANSPAC is a wish come true,” says Buranrom. His recent successful regattas include Phuket King´s Cup, Top of the Gulf, and Samui. Bangkok – The annual “Amazing Thailand Grand Sale” (ATGS’13), organized by the Tourism Authority of Thailand (TAT) with Visa card, is on. To ensure no one misses out on ATGS ’13, Visa offers cardholders up to 80 percent discounts and other privileges from participating retailers in Bangkok, Chiang Mai, Pattaya, Phuket, Hat Yai, Samui, and Hua Hin. Visa cardholders can look out for special offers at leading department stores and shopping complexes: Central, Central World, The Mall, Paragon, Emporium, Robinson, Gaysorn Plaza, Siam Discovery and Erawan. A special grand prize awaits international Visa cardholders, offering them a chance to win the trip of a lifetime: all-expense paid trip to Thailand. Some Bt 1-million in vouchers and experience also await domestic cardholders. In addition Visa will host an interactive three day event, the “Grander than Grand Sale” event at Terminal 21, just for domestic cardholders on July 9-11. The shopping extravaganza offers cardholders special privileges, and the opportunity to win more great prizes: including Bt500 and Bt1,000 in cash vouchers. Visa has worked with TAT to roll out a series of road shows in key international countries, and leveraged its global network to promote ATGS overseas. 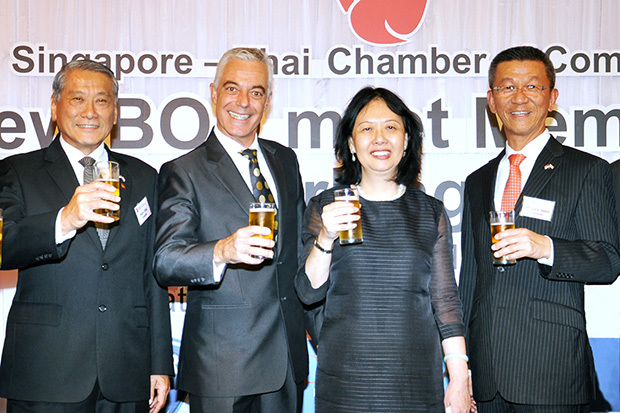 Visa-led marketing campaigns were also launched in collaboration with key banks and retailers. Tourism campaigns reached key countries, such as Singapore, Vietnam, the Philippines, China, Japan, Taiwan, South Korea, as well as Oman, UAE, Bahrain, and Qatar. One of the leading artists in Thailand, Thongchai McIntyre, ‘Bird’ to his fans, paid a visit to Dusit Thani Hua Hin recently. The singer (center) came with his personal manager Pornpichit Pattanatabut (right). 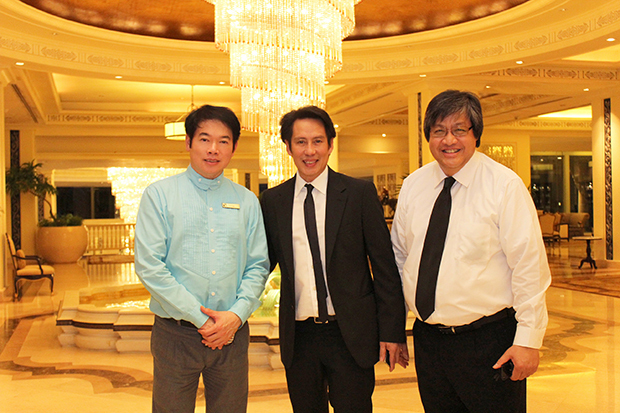 Victor Sukseree (left), GM of Dusit Thani welcomed them. Oasis Spa recently hosted a flamboyant staff party, giving thanks to the hard work and diligent efforts of the staff for a world-class customer service. According to Oasis Spa management, these qualities are the driving force behind their overwhelming success during the past years. The annual staff party was held in The Dream Hotel Bangkok, and gathered more than 80 employees from Oasis Spa´s four branches in Bangkok and Pattaya. The “Regional Best Employees” were rewarded with overseas holidays for their achievements. 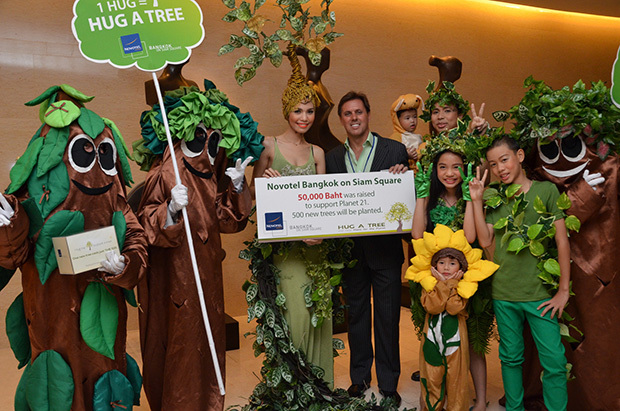 Novotel Bangkok on Siam Square has collected Bt50,000 for its “Hug a Tree” fundraising program. The event, part of “Planet 21” project, invited hotel guests to receive a hug from tree-mascots in exchange for a small donation. Thanks to this fundraising campaign, 500 trees will be planted as a corrective and preventive action in Northern Thailand. Eight Hotels Honoured as Top Performing HotelsReviewed by Travellers on the World’s Largest Travel Site. Bangkok, Thailand, June 2013 – Kasemkij Hotels, the owner and operator of Thailand’s three leading hotel brands, the Cape, Kantary and Kameo Collections, today announced that eight of Kasemkij Hotels’ seventeen properties, namely: Cape House, Bangkok; Cape Nidhra Hotel, HuaHin; Cape Panwa Hotel, Phuket; Kantary Hotel, Ayutthaya; Kantary Hills Hotel, Chiang Mai; Kantary Beach Hotel, KhaoLak; Kantary Bay Hotel, Phuket; and Kameo Grand Hotel, Rayong have been honoured with aCertificate of Excellenceaward from the travel review website TripAdvisoragain this year. The accolade, which honours hospitality excellence, is given only to establishments that consistently achieve outstanding traveller reviews, and only the top-performing tenpercent of hotels listed on TripAdvisorreceive the prestigious award. To qualify, hotels must maintain an overall average rating of four or higher out of a possible five, as reviewed by travellers. Additional criteria include the volume of reviews received within the last twelve months. For more information, please visit www.kasemkij.com.